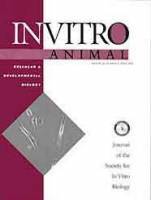 In Vitro Cellular & Developmental Biology - Animal ( ISSN 1071-2690) presents peer-reviewed manuscripts dealing with in vitro cultivation of cells, tissues, organs, and tumors from invertebrates and vertebrates. Published monthly with combined issues in July/August and November/December, this journal is a must-read for scientists working in the fields of vertebrate and invertebrate cell and tissue culture. Offering original papers on timely issues, recent special series included research on NASA Biotechnology/Cell Science in Microgravity and Proceedings from the 2000 International Conference on Invertebrate Cell and Tissue Culture.